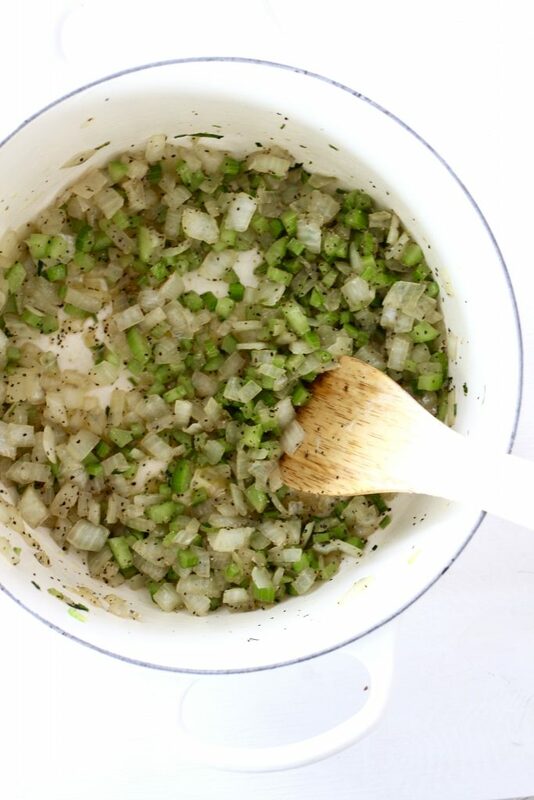 Dressing doesn’t have to be complicated or filled with expensive ingredients to be delicious. 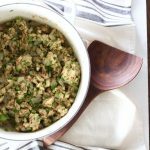 This Meatless Cornbread Dressing is a quick and easy fix if you’re looking for something scrumptious to accompany your holiday turkey or ham! 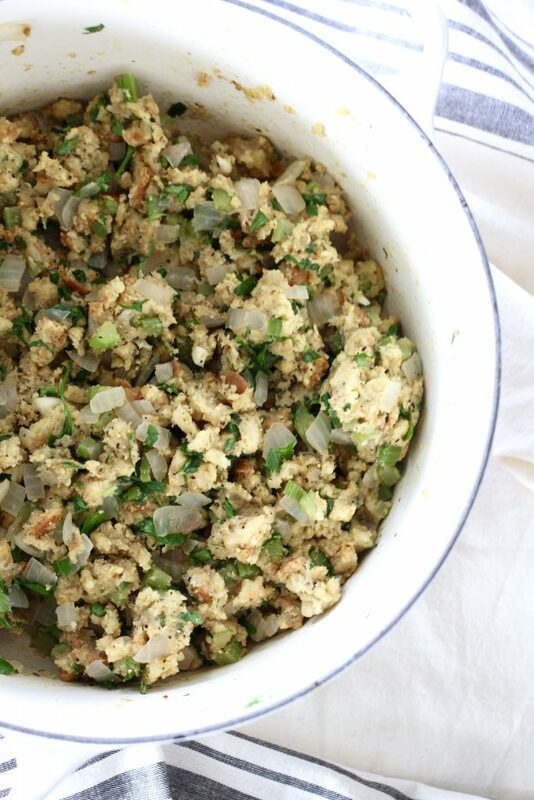 This Meatless Cornbread Dressing consists of a few ingredients and about 5 minutes of sautéing and tossing together. It can be made ahead and is certain to please your guests who are not fond of meat. When I make my homemade Apple, Sausage and Herb Stuffing , I usually dry the bread cubes and then add to the dressing. 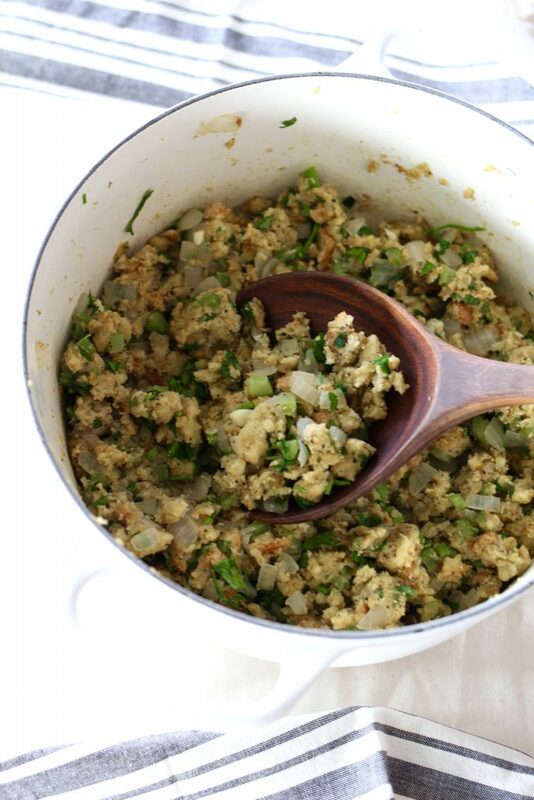 Meatless Cornbread Dressing is made with a bag of pre made cornbread stuffing. Basically, it is cornbread, dried to the crumb stage and then bagged up. If you want to make your own cornbread, you may use a simple cornbread recipe or buy a box of cornbread mix and bake as directed. After the cornbread has baked and cooled completely, cut into cubes, leave on the counter for a day uncovered if possible. The next day, bake in a low and slow oven at about 275 until the cornbread cubes are crispy and completely dried out. Then, proceed with this recipe. 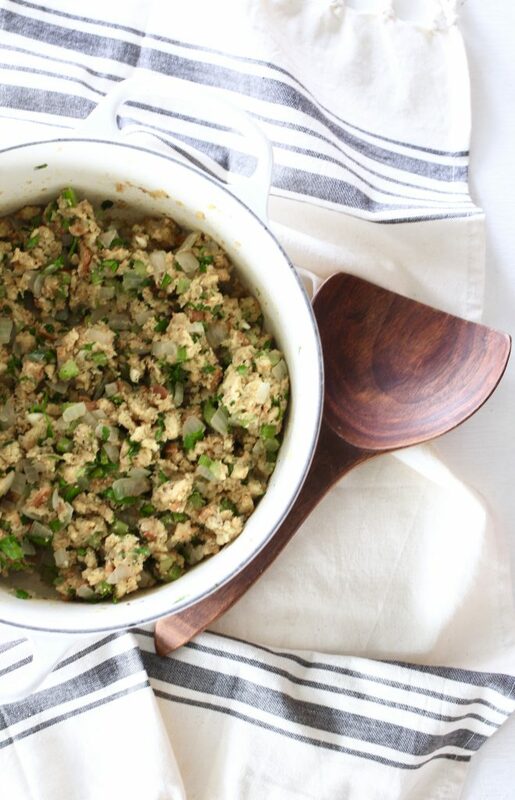 Meatless Cornbread Dressing is the perfect accompaniment to poultry, pork or fish. I love making this when I’m a little overloaded with other dishes in the kitchen and looking for a quick and easy side dish. This recipe is also perfect if you’re a beginner cook and looking for a way to dip your toe into holiday cooking without committing to something that may seem overwhelming. Did that sound weird? “Dipping your toe”, while we are talking about food? Oh my. You’re going to love this simple recipe. Once you master this simple version, you may add other veggies or herbs to spice it up and make it your own! Place heavy pan on stove over medium high heat with olive oil and butter. Add chopped celery and onions to pan. Season with pepper, I use about 1/2 teaspoon. Sautee until onions and celery are softened, stirring to make sure the vegetables do not burn. Cook for about 3-4 minutes. Add minced garlic and turn heat to medium. Sauté for about one minute. Add cornbread stuffing mix to pan, folding in cooked vegetables. Add chicken broth a cup at a time, folding in the cornbread mixture. The cornbread should absorb the liquid completely. Do not be concerned if the stuffing is wet, it will bake out when cooked in oven. Bake at 350 for about 30 minutes, uncovered. If the dressing is too dry, add a bit more broth and cover with lid or foil. Dot with additional butter if desired. Toss with 1 cup fresh parsley before serving.Taste before salting. The cornbread mix and the salt in broth may be enough salt for this recipe. -I like to make sure the veggies are not chopped too fine! -I have used Mrs. Cubbison brand and also Pepperidge Farm bread Cornbread mix. -This recipe may be made two days in advance. Either bake and then reheat, using a little broth to sprinkle over top (about 1/3 cup) to moisten while baking. Or, if not baking right away, mix and bake as directed when ready to serve. Make sure to remove from oven and let sit on counter top for 1 hour before baking to help bring to room temperature. Bake at 325 for 45 minutes, covered.